Austrian composer Anton Eberl was very highly regarded by his contemporaries in his sadly short life. He was widely considered the equal of Mozart, Haydn and the young Beethoven, alongside whose Sinfonia Eroica Eberl's own E flat Symphony was premiered, and by at least one critic deemed superior! Several of Eberl's piano works were even published as by Mozart, something which Eberl and Constanze Mozart fought in vain to rectify: as late as 1944 Eberl's Symphony in C was heralded in Italy as a new Mozart discovery. Alas, much of Eberl's music has been lost, yet what remains is, on the evidence of the few recordings available to date, of the highest quality. Just a few months ago, a recording by the Trio Van Hengel and friends appeared on Ramée (RAM 1103, review) featuring Eberl's magnificent Grand Sextet in E flat and other important chamber works. The pianist on that recording, Anneke Veenhoff, played the same Mathias Müller fortepiano of restored 1810 vintage heard here, and its superb tone almost makes either disc worth the asking price on its own. James McChesney recorded Eberl's Concerto in C with the Slovak Philharmonic for Koch Schwann just over a decade ago, coupled with Eberl's Piano Sonata op.1 (3-6763-2). That disc - unenthusiastically received at the time, to put it mildly - appears to be the only other commercial recording of either of these two works. Memory will be much kinder to the two fine soloists on this CD, both experienced and possessing reliable poise and technique, Italian Paolo Giacometti and Japanese fortepiano specialist Riko Fukuda. This is Fukuda's second appearance on CD with the Kölner Akademie under Michael Willens, the first released around the same time as this one, but on a different label (ARS Produktion AK 8030). With an extensive recording programme mainly for ARS and their championing of numerous neglected composers from the central European tradition and elsewhere, the Kölner Akademie have established something of a reputation for historically detailed performance, right down to seating arrangements! Probably their most high-profile project to date is an ongoing cycle of Mozart's complete Piano Concertos with Ronald Brautigam for BIS - see review of last year's first volume. That project has been called "controversial" in some quarters for reasons that have considerable bearing on the recording under review, namely that there is a loss of dynamic subtlety and sustainability that inevitably comes with the fortepiano and ensemble winds, giving a notably different - for some, alien and even repugnant - feel to familiar music. 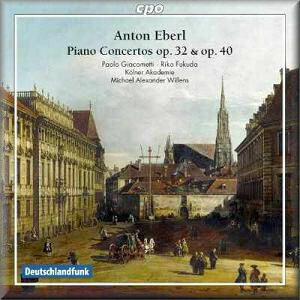 Eberl's Concertos are clearly not going to suffer from the effects of such listening preconceptions to anything like the same degree as Mozart, but the relative lack of nuance, the quietness of the fortepiano against the 'raw blare' of the trumpets and horns - things like this may count for more to some ears than historical facsimile. On the other hand, Eberl seems to be perfectly well aware of these issues, and he is careful to reduce tutti textures where necessary so that little detail is lost to the audience. His writing in these two Concertos, dating from only a short time after his music was often held to be stylistically inseparable from Mozart's, is still clearly influenced by the latter, who of course did so much to distil and determine the form of the genre. Orchestration, however, is more broadly reminiscent of Haydn, impeccably done in the most elegant style of the day, inventive but decorous, and with Haydnesque good humour, wit and flashes of harmonic daring. The piano writing brings to mind Hummel, with Eberl making sustained, thrilling and full use of the now six-octave keyboard in a way that Mozart was obviously unable. Whilst there is no doubting the high quality of Eberl's music, the same cannot be said of the sound, which suffers from a certain lack of depth, with minor distortion when the orchestra is at its loudest. Given this lossy feel, it may make more sense for those interested to acquire these recordings instead as top-rate mp3 downloads, where around 50% of the CD price (at the time of writing) may be saved. Microphones are also less than ideally placed, picking up the fortepiano's action, someone's squeaky shoes and the odd inhalation of the conductor. Surprising that an institution as hallowed as Deutschlandfunk should not subject their recordings to more vigorous quality control. As usual, CPO provide detailed, extensive notes. However, after a decent biographical account of Eberl's life, writer Bert Hagels unfortunately spends too much time describing the music in exclusively technical detail that may be beyond the ken of the non-musician, lurching from one "triadic chord in the root position" to the next "tonic parallel harmonized as the F major subdominant" for almost eight columns. As usual too the notes are less than flowingly translated.